It looks like Trinity, aka the next generation big APU, is going to be everything the rumors suggest. 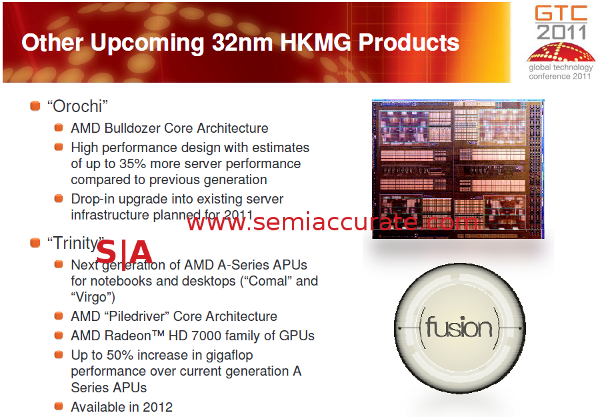 At Global Foundries GTC conference today, they foundry confirmed many of the rumors that are floating. There are four big bits to be aware of on the slide above, the code names, CPU core, GPU core, and performance. The dates are pretty well known, as is most of the rest, but it is always nice to see things in black and white, with flashes of orange, yellow, and brown. It makes nice reading and has a spiffy southwestern motif. Platform code names, Comal and Virgo, are pretty well known, and we showed you pictures of a running laptop over two months ago. In fact, we held a working CPU three months ago, so suffice it to say that the project is way ahead of schedule. Comal and Virgo are simply the bits that the CPU gets plugged in to. The date listed is 2012, think earlier rather than later. Moles tell us that CES is a distinct possibility for a soft launch, and maybe more. Piledriver is a fancy name for a mildly tweaked Bulldozer core. Bulldozer is late, but the design was mostly done a long time ago. The elves that made Bulldozer were immediately put to work on polishing the corners that they couldn’t do earlier, and that is called Piledriver. Don’t expect miracles, but it should be noticeable update. Last is the most interesting, a 50% increase in Gigaflops. The cores, going from stars to dragon, probably keeps the core count the same, but Llano gets the overwhelming majority of its flops from the GPU side. The difference in CPU contributed flops is probably a rounding error for this calculation.